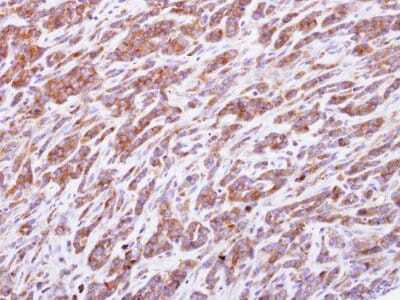 Recombinant Human PRPS1 protein (ab92935) can be used as a positive control in WB. 293T, Rat liver or Mouse kidney lysate, TOV-21G xenograft tissue. Our Abpromise guarantee covers the use of ab154721 in the following tested applications. WB 1/500 - 1/3000. Predicted molecular weight: 34 kDa. IHC-P 1/100 - 1/1000. Perform heat mediated antigen retrieval with citrate buffer pH 6 before commencing with IHC staining protocol. Alternatively Tris-EDTA buffer (pH8.0) may be used. Metabolic intermediate biosynthesis; 5-phospho-alpha-D-ribose 1-diphosphate biosynthesis; 5-phospho-alpha-D-ribose 1-diphosphate from D-ribose 5-phosphate (route I): step 1/1. Defects in PRPS1 are the cause of phosphoribosylpyrophosphate synthetase superactivity (PRPS1 superactivity) [MIM:300661]; also known as PRPS-related gout. It is a familial disorder characterized by excessive purine production, gout and uric acid urolithiasis. Defects in PRPS1 are the cause of Charcot-Marie-Tooth disease X-linked recessive type 5 (CMTX5) [MIM:311070]; also known as optic atrophy-polyneuropathy-deafness or Rosenberg-Chutorian syndrome. CMTX5 is a form of Charcot-Marie-Tooth disease, the most common inherited disorder of the peripheral nervous system. Charcot-Marie-Tooth disease is classified in two main groups on the basis of electrophysiologic properties and histopathology: primary peripheral demyelinating neuropathies characterized by severely reduced motor nerve conduction velocities (NCVs) (less than 38m/s) and segmental demyelination and remyelination, and primary peripheral axonal neuropathies characterized by normal or mildly reduced NCVs and chronic axonal degeneration and regeneration on nerve biopsy. Defects in PRPS1 are the cause of ARTS syndrome (ARTS) [MIM:301835]; also known as fatal ataxia X-linked with deafness and loss of vision. ARTS is a disorder characterized by mental retardation, early-onset hypotonia, ataxia, delayed motor development, hearing impairment, and optic atrophy. Susceptibility to infections, especially of the upper respiratory tract, can result in early death. Defects in PRPS1 are the cause of deafness X-linked type 1 (DFNX1) [MIM:304500]; also known as congenital sensorineural deafness X-linked 2 (DFN2). It is a form of deafness characterized by progressive, severe-to-profound sensorineural hearing loss in males. Females manifest mild to moderate hearing loss. Belongs to the ribose-phosphate pyrophosphokinase family. Immunohistochemical analysis of paraffin embedded Human TOV-21G xenograft tissue labeling PRPS1 with ab154721 at a 1/500 dilution. ab154721 has not yet been referenced specifically in any publications. Publishing research using ab154721? Please let us know so that we can cite the reference in this datasheet. There are currently no Customer reviews or Questions for ab154721.